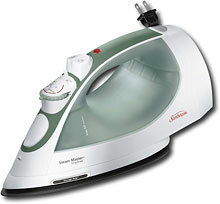 This iron has done every job I have needed it to, from ironing clothes to adhering iron-on patches to folding over seams. I have found that on some fabrics the iron does not smoothly glide across it, making you work a little more at ironing out all the wrinkles. This has been a rare problem for me, however. There are many settings for heat, steam and spritzing. This makes it very convenient to get just the right setting for what you are ironing. If there are some tough wrinkles that just don’t want to come out, you can either spray some water on the spot and then iron it or you can give the wrinkle an extra burst of steam as the iron rests over it. The iron comes with a water cup making it easy and mess free to add more water to the reservoir. That being said, even with the highest steam option on, the iron does not go through water very fast. I almost never use a full reservoir of water in one ironing (even if that is a full day of sewing). This iron is not expensive, but works great. It is also backed by a good warranty and friendly customer service. The first one I had started leaving reddish-brown spots on the cloth. After contacting the company regarding the problem, I was shipped a new one at no cost to me. I have had no problems with the second iron. Overall I would recommend this iron to anyone looking for an economic iron. It performs well at a reasonable price.